K.C. Coin-op is buying any antique coin operated machine, such as the early Upright Floor Machines to the later mechanical Slot Machines. 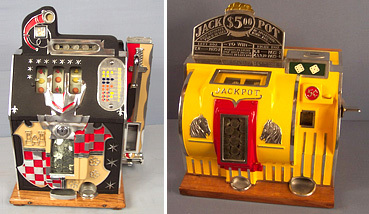 These machines came in many different variations, styles, and ways to gamble with. We are also looking for other machines which were widely produced in the first half of this century such as the Trade Stimulators which were made in endless varieties. We want to buy any Arcade Machines from the early penny machines all the way up to the machines you may find in the corner shop today. The Vending Machines which held peanuts, gum, candy, cigars, etc. are also of interest to us. If you have one, two, three, or a basement full let us know. If you have a Jukebox no matter what condition we are very interested, barn fresh we want it! The early coin operated Scales are also something we would like to acquire so if you have anything of interest for sale we would like to talk to you. We are looking for many different Collectibles so even if it doesn't take a coin we still want it. If you have an item from the old country store, an old western item, or even a nice old porcelain sign we want to talk to you. Contact us and we will get back to you as soon as possible.